Severe rainstorms in July 2004 caused flooding on streets, roadways and in more than 4,000 homes throughout Edmonton. Damage to public and private property was extensive. The Flood Prevention Program addresses flood issues in 43 at-risk neighbourhoods. Major problem areas are being addressed first to minimize severe flood risk. This work identifies drainage improvement projects according to the greatest concentration of flood-impacted heighbourhoods. The flood prevention works have been substantially completed in 12 of the 31 neighbourhoods. Aquired surplus school sites are retrofitted as stormwater management facilities such as dry ponds for the purpose of flood prevention. Responding to, investigating, evaluating and undertaking minor works to address surface drainage concerns. The work ensures that the existing overland drainage system is functioning properly and efficiently to prevent flooding or maintenance problems for the residents. 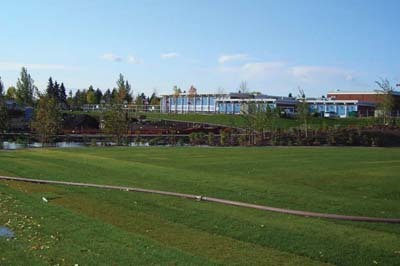 Morris Pond is a stormwater management facility located west of 34 Street, between 84 Avenue and 92 Avenue. This flood control facility is designed to control stormwater flows within Gold Bar Creek for existing and future development, and reduce downstream erosion.